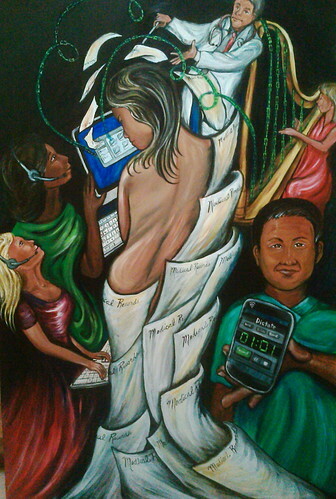 This is my painting describing the August 9, 2012 Association for Healthcare Documentation Integrity (AHDI) Annual Conference, Indianapolis, Indiana. This is a workflow. It is beautiful. Every instrument is important within the performance. 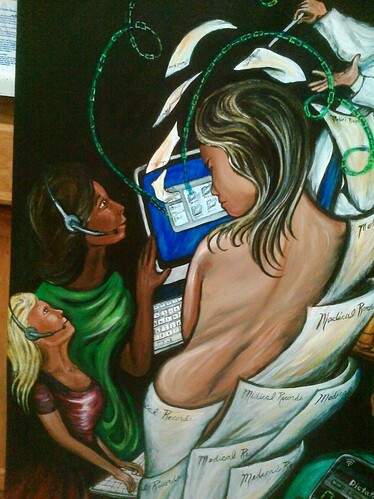 This painting begins in the middle with the patient, for this is patient centered care. The patient is relaxed her back is bare. Cascades of paper medical records caress her legs as they fly up above her and into her electronic medical record. 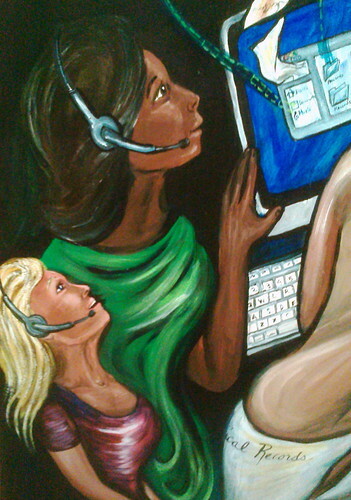 She is viewing this information using a patient portal. 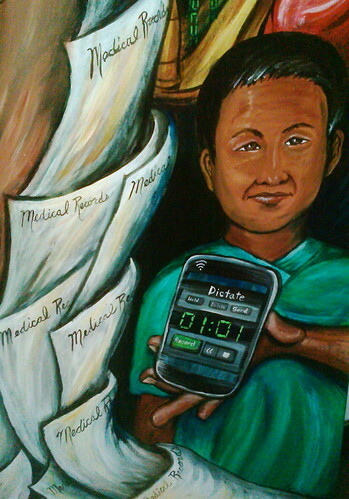 Below our patient to the left, a provider holds out a smart phone displaying a dictation ap. He is showing the power of digitized data. 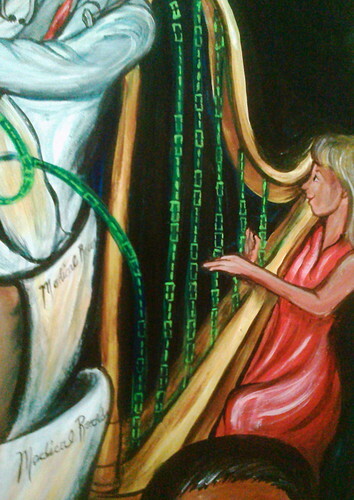 Above this man is a woman playing a binary harp. She is creating the code that supports our composition. Above our patient the conductor is a doctor. 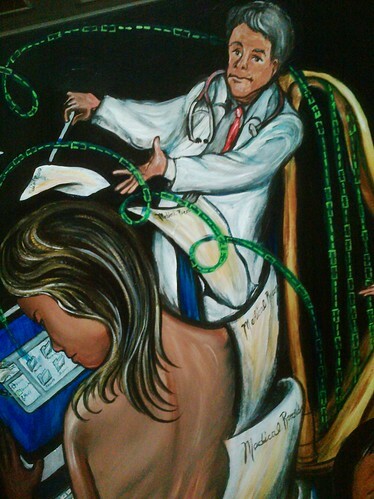 He is prescribing the path of care. He holds his baton and leads the other players in a crescendo of data. To the left two medical transcription scribes stand in rapt attention as they play their very important part in this orchestra. These figures performing together create flow and are triumphant. Everyone is important and the patient’s future depends on all of them playing their best. I am a patient in the "system" in Indinapolis, IN. The hospital I frequent in Indy is in the process of converting to e-patient, and I cannot begin to tell you how much easier it is...Especially when compared with the hospital I use in Columbus, where everything is still paper. Your painting is beautiful and makes me a little proud to be where I'm at! That is great to about the conversion from paper to electronic! Regina, as a medical transcriptionist I am so proud that you created The Orchestra to celebrate National Medical Transcription Week! I love how you show the patient in the center, which is how the system truly should work. And the fact that she is literally dressed in her medical records is brilliant! 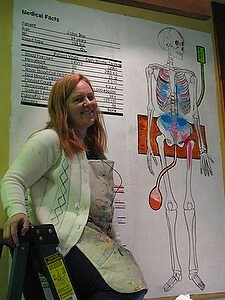 And for me, best of all, the transcriptionists are standing at the patient's side, playing their part in the symphony along with the dictating doctor and the binary harpist, all coordinated by the physician conductor. This is a beautiful piece of work, without a doubt the best MT Week poster ever! Thank you for creating it for us! I can't wait to see your keynote at the Association for Healthcare Documentation Integrity annual meeting in August! Thank you. It was wonderful to paint this. I am so glad I get to speak before you in August! I agree with Susan! 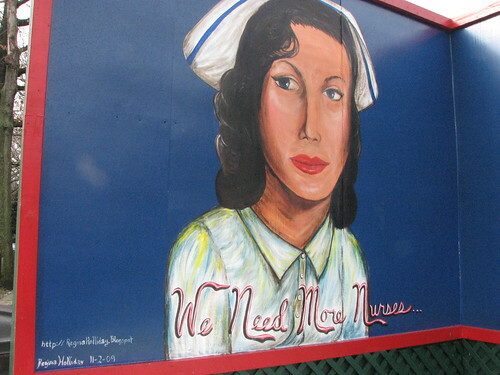 A great job that represents what those in our organization do AND a wonderful reminder that indeed everything we do centers around the patient. We will look forward to your presentation in August! Art is a powerful force. Regina Holliday you are instigating profound change. I agree with Susan. Thank you for sharing your gift of interpretation with our profession. You are truly gifted.